The Minneapolis Grain Exchange sounds like an operation left behind by time, but it is still very relevant today, providing resources and information in the grain market world. Their business model has changed drastically since they were formed in 1881 and as a result they no longer need half a city block worth of floor space, which was critical in the early years. The need to examine grain shipped from around the US by natural light to determine the product quality has also diminished. 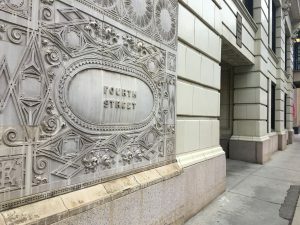 Just because electronic trading changed the operations of the Minneapolis Grain Exchange did not mean the building located at 400 South 4th Street needed to change as well. On December 19, 2008, the final day of open outcry futures trading on the historic trading floor, the owners looked to find a second life for the building they had used for most of their 105 year life. They found ample tenants by continuing the office use within the building. It is currently home to numerous businesses, with a coworking space residing on the trading floor. With the 1995 National Register of Historic Places and Minneapolis Heritage Preservation Commission designations, the owners knew the trading floor had to maintain its massive 75 foot by 132 foot open floor plan. They found an ideal tenant in COCO, a company providing coworking space for individuals and companies in an open layout, perfect for preserving the trading floor. The original trading price marquee and the more modern digital display are still intact with figures on the marquee remaining from the last day of operation. The trading pit, where so many heated debates over grain prices took place, is now a bean bag lounge area. Visible on each floor are the original mail chutes, grain embossed elevator doors, ornate plaster work, iron stair railings, and marble flooring. The additions to the original building over time are noticeable throughout the corridors. The Minneapolis Grain Exchange building is not one, but three separate buildings, joined together through shared walls and skyways. The oldest structure dates back to 1902. Quickly outgrowing the space, six years later, the 1909 East Building was constructed. The North Building was added in 1928 at the corner of Fourth Avenue and Third Street. The most notable fact about this addition is that the demolition of the original 1884 Chamber of Commerce building and construction of the new building took just six months to complete after beginning on January 1, 1928. The Minneapolis Grain Exchange might not see themselves as preservationists, but they have contributed greatly to the field of preservation in Minneapolis and to the sense of place in downtown. While so many businesses gave way to urban renewal, they stayed in their historic building, showing a commitment to history and the environment surrounding them. Before the trading floor closed in 2008, they were preserving a piece of history by keeping the building alive with their operations for 94 years. Minneapolis needs more preservationists like the Minneapolis Grain Exchange, keeping our old buildings standing by keeping them in use.